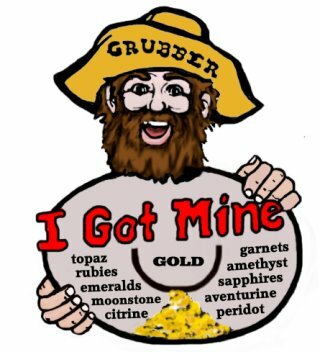 This 1/2 gallon bucket contains picker size gold nuggets and beautiful gemstones!! The combo also includes a 1/2 gallon bucket, 1 oz. gold vial and a 10 inch black gold pan. ***gemstones and gold pictured are examples of what you may find, but may vary in size and quantity. $25.00 Shipping inside the U.S. Please call for International shipping prices. ** We do not accept AMEX for online orders ** We apologize for any inconvenience this may cause. This 1 gallon bucket contains picker size gold nuggets and beautiful gemstones!! The combo also includes a 1 gallon bucket, 1 oz. gold vial and a 10 inch black gold pan. ***gemstones and gold pictured are examples of what you may find, but may vary in size and quantity. $25.00 Shipping inside the U.S. Please call for International shipping price ** We do not accept AMEX for online orders ** We apologize for any inconvenience this may cause. Standard Gem Bag 10-12 lbs of our gem ore! Find rubies, sapphires, emeralds, amethyst, topaz, citrine, garnets and lots more. Our most popular economy bucket! Gem chart is included to help you identify your gemstone finds! Ask about our gem cutting service! info@goldngem.com Gemstones pictured are examples of what you may find, but may vary in size and quantity. $15.00 shipping inside the US. ** We do not accept AMEX for online orders ** We apologize for any inconvenience this may cause. Super Gem Bag - Better! 15-20 lbs of our exciting gem ore! Find rubies, sapphires, emeralds, amethyst, topaz, citrine, garnets and lots more. Our most popular family bucket! Gem chart is included to help you identify your gemstone finds! Ask about our gem cutting service! info@goldngem.com Gemstones pictured are examples of what you may find, but may vary in size and quantity. $15.00 shipping inside the US. ** We do not accept AMEX for online orders ** We apologize for any inconvenience this may cause. 111GBYPD PAYDIRT Gem Bag - Even Better! Paydirt Gem Bag - Even Better! Bigger is better! These 15-20 lb gem bags are loaded with our native gemstones as well as gem specimens from around the world! Large size gemstones are the real find here and there are plenty of them! Find rubies, sapphires, emeralds, amethyst, topaz, citrine, garnets and lots more! Gem chart is included to help you identify your gemstone finds! Ask about our gem cutting service! info@goldngem.com Gemstones pictured are examples of what you may find, but may vary in size and quantity. $15.00 shipping inside the US. ** We do not accept AMEX for online orders ** We apologize for any inconvenience this may cause.